Expporter and supplier of Brown Mustard Seeds. We provide our clients a wide range of Brown Mustard Seeds that is used as a spice by grinding and mixing them with water and vinegar. These seeds are also processed to make mustard oil and sauces, which are immensely used in Indian delicacies. Our range has a rich and nutty flavor that adds mouth watering taste to the preparations. 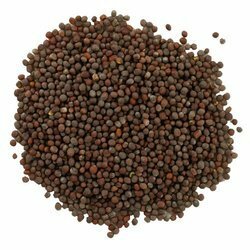 Available with us, are Brown Mustard Seeds that are also known as black mustard seeds. Due to their hot and pungent properties, these seeds are combined with cumin seeds and fried in oil until they pop. These seeds add a superb taste to the vegetable dishes and curries with pleasing aroma hence are extensively used in Indian cuisine. Mustard seeds are the proverbially small seeds of the various mustard plants. The seeds are about 1 mm in diameter, and may be colored from yellowish white to black. They are important spices in many regional cuisines. The seeds can come from three different plants: black mustard (B. nigra), brown Indian mustard (B. juncea), and white or yellow mustard (B. hirta/Sinapis alba). 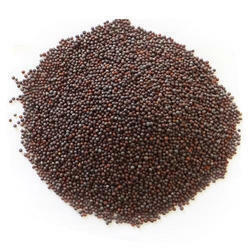 Yellow Mustard seed is a round hard seed, beige or straw coloured. Its light outer skin is removed before sale. With its milder flavour and good preservative qualities, this is the one that is most commonly used in ballpark mustard and in pickling. Brown Mustard (Brassica juncea) is similar in size to the black variety and vary in colour from light to dark brown. It is more pungent than the white, less than the black.